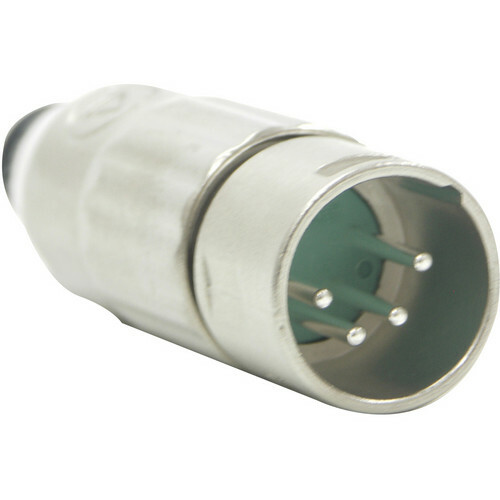 Switchcraft's AAA Series 4-Pin XLR Male Cable Mount (Nickel Metal Finish, Silver Pins) is a premium XLR connector and has only two pieces to assemble. This XLR connector has an easy twist on handle that reduces assembly time, a rugged die-cast metal handle and because of its strain relief, it accommodates wide cable OD ranges. Box Dimensions (LxWxH) 2.0 x 1.4 x 0.55"
AAA Series 4-Pin XLR Male Cable Mount (Nickel Metal Finish, Silver Pins) is rated 4.5 out of 5 by 2. Rated 4 out of 5 by phantompwr from Works very well I got several of these to convert my chargers to be interchangeable. They were easy to solder and put together and work great. The build quality isn't quite as good as Neutrik, but they all work and were less expensive to I'm happy.